One day, as we were having dinner, we looked up and saw the trailer of Monster University on the TV. Because we had enjoyed Monsters, Inc. so much, we couldn’t wait to see the prequel. We rushed to the theater, but there was already a long line forming! Because this new movie is going to be too popular, the theater opened an extra ticket window selling only Monster University tickets. We finally did get in, and it really was worth the trouble! 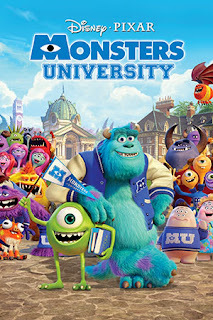 Monsters University is a warm and happy movie that we recommend to everyone, especially, families with children. Monster University is the story of how Mike, voiced by Billy Crystal, meets his future life-long friend, Sully, voiced by John Goodman. Michael is a young monster who has short legs and is not frightening enough to scare anyone. In order to become “scarier”, Michael studies hard and becomes the best student in class. Sully, whose father was a famous scarer, is lazy and naughty. On the day of the final exam, Mike and Sully broke the principal`s Lifetime Achievement Award and were kicked out of school. In order to get back into Monster University, Mike and Sully join the worst club, Oozma Kappa, and compete for the award of the school’s best scarer. In the final contest, the competition was tough. However, Sully cheated on Mike’s turn. Because of this event, Michael was sad and disappointed. To prove his ability, Mike challenged the most difficult level, a level that even the principal was afraid to challenge. How does the story end? Of course, you will have to see the movie yourself to find out! The Monster University animation was great, like all Pixar animated movies, and the background music worked really well with the story. We felt like we were right there in the movie. The story is easy to understand, and has an inspiring message about friendship. We enjoyed this movie because we also agree that good friends are precious, and we have to treasure what we have. Also, like Mike found out, if you have a dream and just work hard, you can make your dream come true. To be successful is not easy, but if you don’t try, you will never succeed. You also have to remember that you are not alone, that your friends are always behind you. We recommend that everyone watch this movie. It is only a cartoon movie, but it also can make you think about your life.